Digital x-rays are faster and more versatile than conventional x-rays, and they provide a greater level of comfort for you. 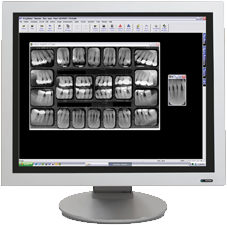 Digital x-rays help us accurately diagnose your dental needs, and with significantly less radiation exposure than conventional x-rays! Because it doesn’t require chemical processing, digital technology helps us do our part to keep the environment safe, too. Digital x-rays enable us to better educate our patients about their oral health needs and smile enhancement options, and we believe that education is the key to helping patients make wise and informed decisions. Composite fillings can be bonded to teeth, which means adhesively held in place. The bonding allows for a more conservative preparation where less healthy tooth structure is removed. This often results in smaller fillings than amalgam (silver) fillings, so they look more natural! The composite material is cured with an intense light and the surface is shaped and polished, so the end result is a virtually undetectable restoration that feels natural in your mouth. Not only do whiter teeth give you a cleaner looking and more attractive smile, but they can also enhance your confidence and self-esteem. As a bonus, whitening can lead to healthier teeth because when your teeth look better, you tend to take better care of them to keep them looking terrific. We offer take-home whitening trays that are custom made to fit your mouth and give you the power to whiten your teeth in the comfort of your own home. The custom trays are used to apply a gel made from a lower concentration of hydrogen peroxide, which allows it to remain safely on your teeth longer (sometimes even overnight). Take-home whitening can achieve the same stain-free look as other in-office whitening treatments, it just takes a little longer. Ask us about brightening your smile at your next visit. Porcelain veneers can help you smile bigger, brighter and with more confidence by giving you the smile of your dreams. Veneers are thin, custom-made casings applied to the front of your teeth. They are made with durable, tooth-colored materials to look and feel natural in your mouth. When applied, a small amount of tooth enamel usually needs to be removed to fit the veneers onto your teeth. For this reason, veneers are typically an irreversible treatment so it’s important to be prepared for a permanent improvement in the look of your smile. Life is more beautiful when you have the confidence in your smile to let it show. If you spend your time trying to hide your smile, ask us how porcelain veneers can give you the confidence to smile big! Teeth grinding (bruxism) often occurs during sleep, and it can create pressure that often results in headaches, neck, jaw, or ear pain, tense muscles, and excessive wear on your teeth. Collectively these symptoms are referred to as “TMJ disorder”. Bruxism affects an estimated 30-40 million Americans, and if left untreated, it can permanently damage the temporomandibular joint. A dental nightguard is the most common treatment for TMD. A nightguard is a horseshoe-shaped plastic mouth appliance that resembles a retainer. It can be worn on either the top or bottom arch to provide a protective cushion between the upper and lower teeth and guard them against the pressure of clenching and grinding. 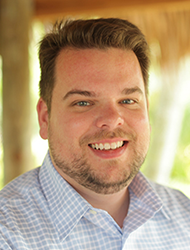 My team and I can also reshape the biting surfaces of the teeth in a process called occlusal equillibration, which can help improve the way your upper and lower teeth fit and function together. Ask us about your options at your visit! Dental anxieties are not unusual, and people of any age can experience such feelings. If you’ve been avoiding seeing a dentist because of anxiety about dental treatment, please call us today. More and more life-threatening illnesses are being linked to the presence of dental diseases. We understand your anxiety and will work with you, so you can receive the treatment you desire at a pace that makes you feel comfortable. When you share your feelings and concerns with us, we can accommodate you and make your dental visits as relaxing as possible. You’ll be glad you called, and we’ll be glad to take great care of you. Happy patients spend less time in the dental chair with more comfort. That’s why we use the Isolite® System! This system has a soft and flexible mouthpiece to shield your tongue and cheek during procedures, AND it provides a place for you to rest your jaw. The Isolite illuminates your mouth from the inside so treatments are shadowless and more efficient, but best of all, it eliminates the need for cotton rolls and rinse breaks! Come in today and experience the difference. 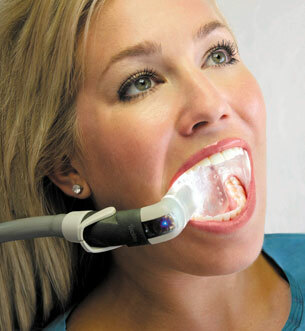 Our intraoral camera is one of our best patient education tools. This small camera allows us to show our patients exactly what we see during the exam, which helps us walk patients through his or her diagnosis and treatment options. Having this information, in turn, helps our patients make informed decisions about oral health care and lets us provide more personalized treatment. The camera also takes digital photos of the inside of the mouth, which we can then use to help patients better understand procedures. Most dental work is done under 4.5 magnification.